One cake so moist and delicious, I couldn’t you can’t help but be appalled by the inadequacy of your fork to do its job. Now, when it comes to cooking and baking, the majority of the time, I’m a make-from-scratch kinda girl. 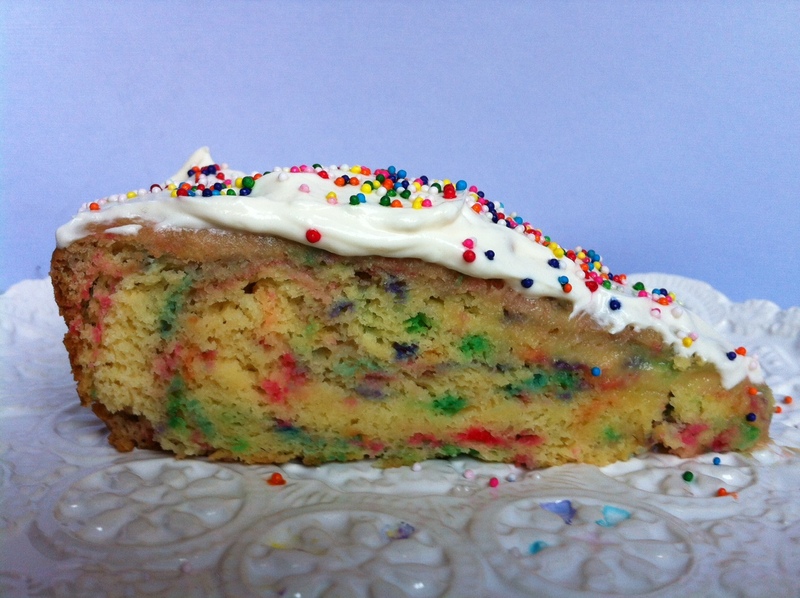 But dash it all, sometimes that childhood Betty Crocker vanilla birthday cake taste is EXACTLY what I’m looking for. 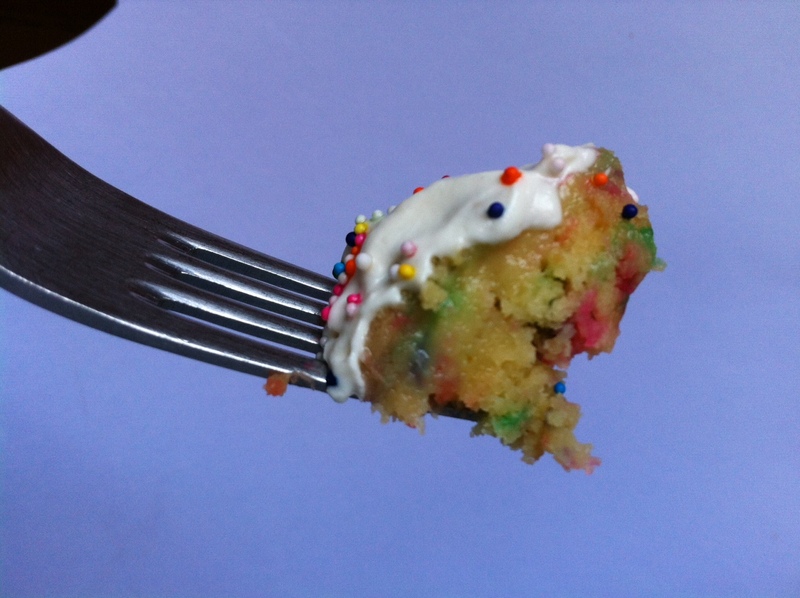 I’d heard of using instant pudding in cake-mix cakes along with the typical add-ins, but I wanted something even easier. After a bit of Google-rummaging, I found a few recipes that nixed almost everything but the instant pudding. The recipe that will unfold before you is winning amalgam of those few. Not only does this recipe take all of five minutes to whip up before popping in the oven, it’s significantly HEALTHIER than a traditional cake-mix cake. No butter, no oil and MOST IMPORTANTLY, a serious reduction in sugar. Before we dive in, let me just express that in my opinion, moderate use of butter and heart-healthy oils like canola and coconut is PART OF A BALANCED lifestyle. Despite my love of all things sweet, however; I will almost always be an advocate of less sugar in recipes. 2) Most recipes call for more than necessary to make a great-tasting product. 3) There’s nothing scarier than being at the whim of your dentist and his drill. Just sayin’. Start by preheating your oven to 350 degrees, and grease a 9×13 in. baking dish or a round cake pan–we used melted butter, but you can use canola oil or other spray if you like (‘we’–roomie Carina co-chaired this project with me!). Empty your packet of instant pudding into a bowl along with two cups of COLD milk, and whisk vigorously for about two minutes, or until the mixture begins to thicken. Bring back that elbow grease! 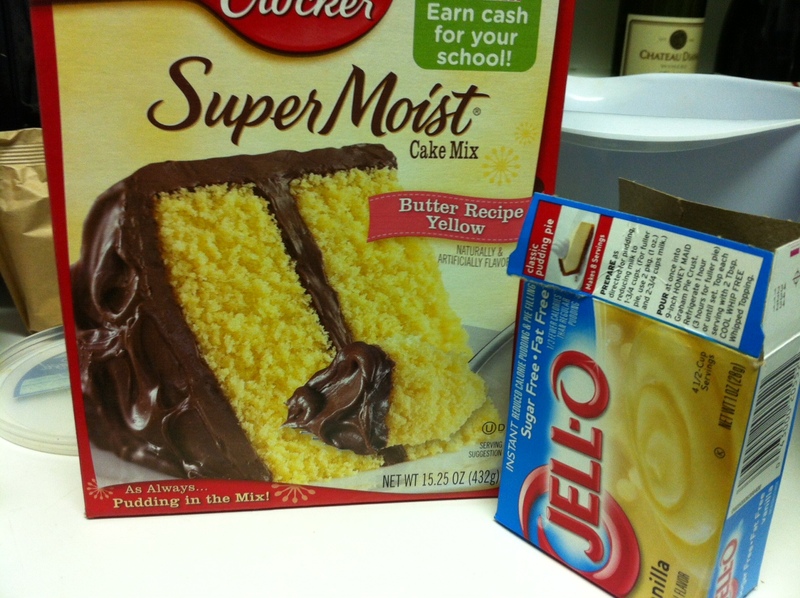 Open your box of cake mix and slowly add it into the pudding along with one teaspoon of vanilla extract (optional). 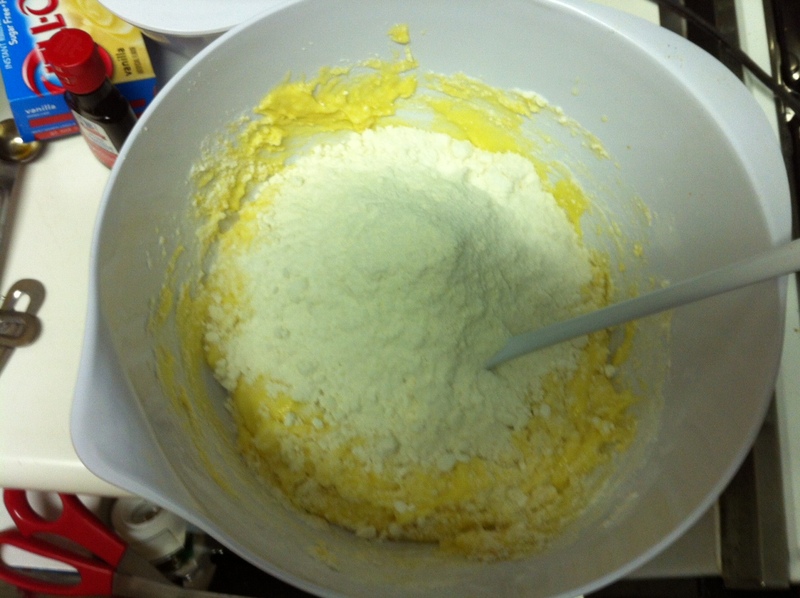 Once the batter is just barely incorporated, stir in any goodies that you like. Carina and I opted for spring-time sprinkles! Around this time, that familiar and intoxicating scent of reproduction cake batter will start makin’ you a little light-headed. Stay strong. 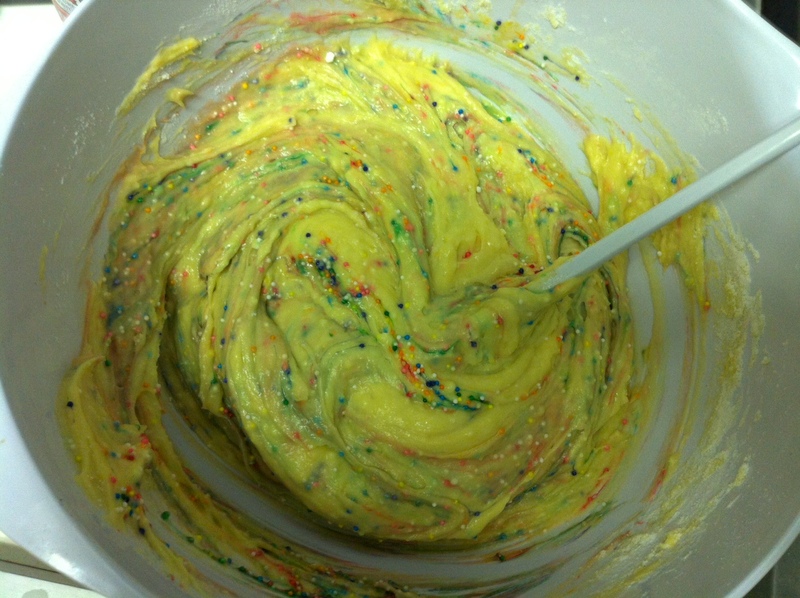 It is important that you taste the batter while remaining aware of your surroundings. You CAN be in control of the situation–we’re not bobbing for apples here, people. Stick with a mixing spoonful. Remember that there is more to come. 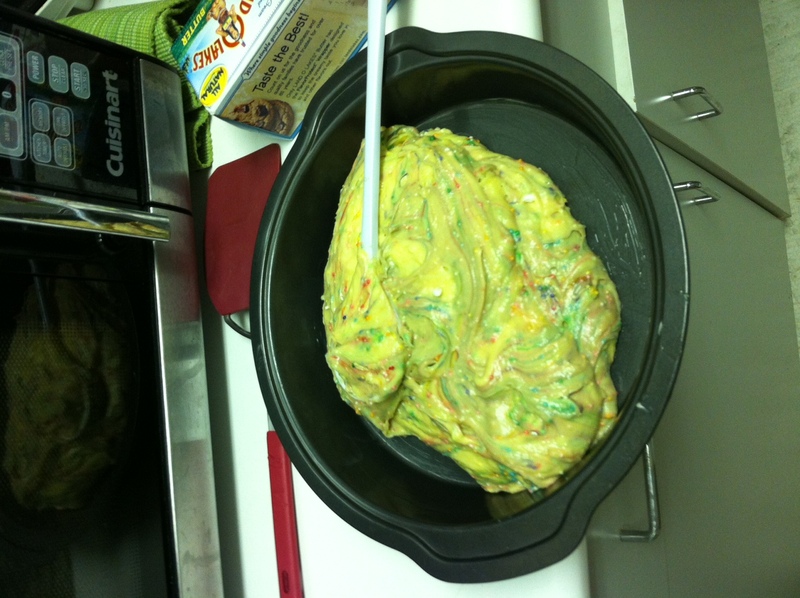 Now, just pour the batter into your greased baking dish and pop it into your preheated oven. Alright, you have some time to regroup. 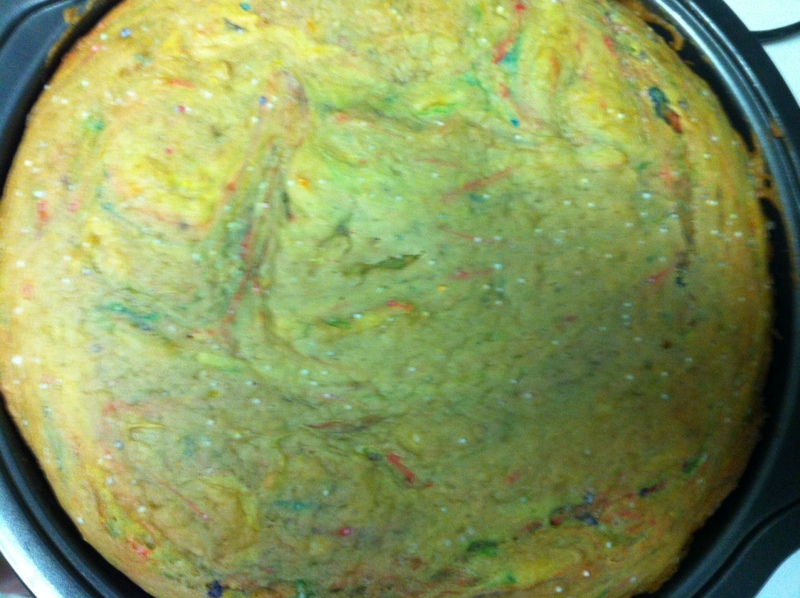 I would recommend beginning to check on your cake after 25 minutes, and every 5-10 minutes thereafter. It can take up to 40 minutes, depending on your oven. You want to be able to stick a toothpick or fork in and have it come out with a tiny bit of dough–not completely clean. When AREN’T sprinkles a good idea? Once out, use the stamina you built during that re-grouping period to LET YOUR CAKE COOL FOR AT LEAST TEN MINUTES. Not gonna lie, 10 was ALL we gave it. We topped our slices with another version of protein frosting! This brilliant version was inspired by Carina’s fabulous mom, and I gotta say, it knocks version 1 outta the park. Stir together and MARVEL. This stuff is addicting. Schmeared on a piece of 1-2-3 Cake? I think I blacked out. 1 container sprinkles or add-in of your choice. White chocolate chips? Coconut? Sky’s the limit. This cake could also be made using CHOCOLATE cake mix and chocolate instant pudding, or whatever combination your heart desires! 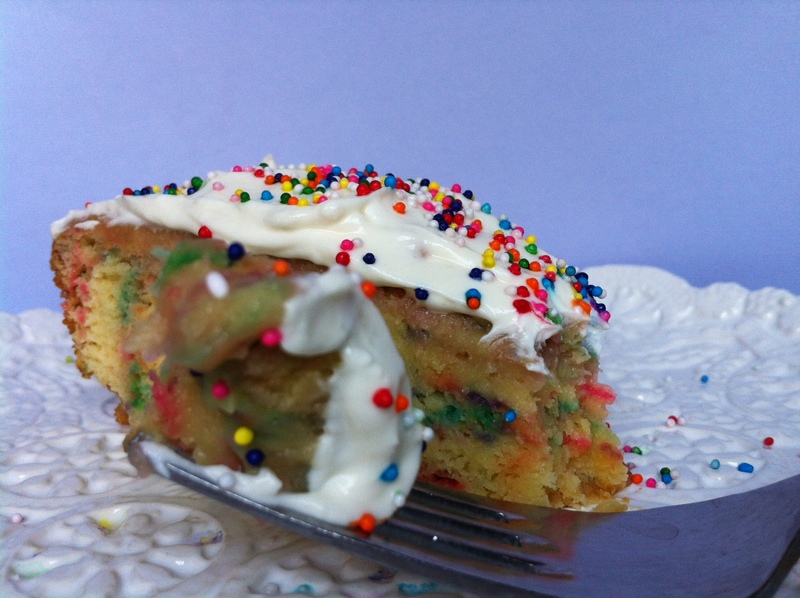 EASY PEASY and absurdly tasty, this cake is the perfect solution when you’re in need of a quick party dessert, or when you just need to experience the miracle of having an ENTIRE cake before YOU in a matter of minutes! Now all you need are some party hats and a scary clown to complete the time warp! Let me know if you give this incredible recipe a try, and have a great Saturday night!